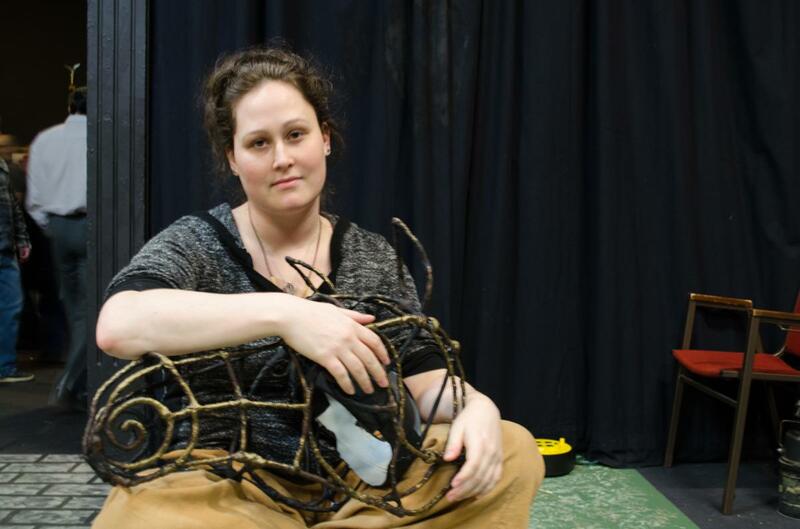 The Forge Theater’s production of Equus, which runs weekends through April 30, brings Sir Peter Schaffer’s Tony Award-winning play to Phoenixville. In our interview with director Suki Saurus, she described the production as a dream project for her, one that she has been eager to tackle since first reading the script as a teenager. Her thoughtfulness over the years has clearly paid off. 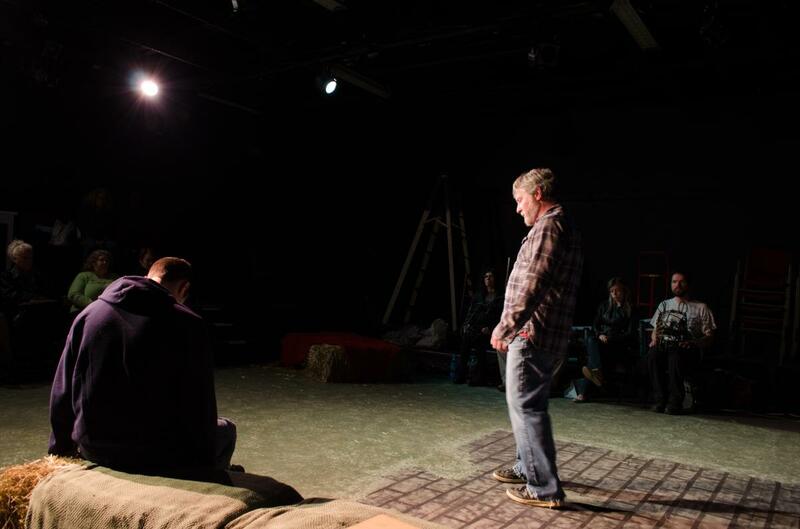 This production of Equus, a challenging piece because of its subject matter, is uniformly focused, generally well-acted, sometimes witty and always respectful of both its cast and audience. It could even be called sharp, a blatant double entendre for its major plot point. The drama centers on 17 year-old Alan Strang (Matt Ronzani), who Shaffer has either consciously or unconsciously saddled with a last name that is one letter away from being strange. And indeed, he is odd. Strang’s tightly bound parents have inadvertently warped his worldview into a confusing jumble of horse imagery and religious fervor. As he matures, his self-identity eventually renders him unable to connect with anyone, including his parents. His fixation then interferes with a potential girlfriend, with tragic results. Out of sheer frustration and guilt, he goes on a violent rampage in a stable, blinding six horses with a pick. A magistrate turns Strang over to a psychologist, Martin Dysart (Eric Jarrell) for help. Director Saurus benefits from a number of advantages. One is the performance space itself. The black-box arrangement of the Forge Theater ensures maximum dramatic effect of the play’s many raw emotional highpoints. The audience surrounds the action from seats on three sides. The flexible set easily transitions from office to barn, with strategically placed hay bales doubling for a variety of furniture pieces. Judicious painting of the stage floor also helps with the story’s various locations, mimicing both linoleum and cobblestone. Saurus was also gifted with a talented and brave cast. Ronzani, as Alan, is unflinching from the role’s heavy demands, especially in the second act. The script requires full-fledged commitment from the performers in an environment of ultimate trust. Ronzani, Saurus, actress Tiffany Moskow (as Strang’s love interest) and the entire company have clearly created exactly that. Jarrell as Dysart (the psychiatrist) is a true standout. His long passages of explanatory monologue are quite challenging, but Jarrell keeps them clear and comprehensible. Murray Kramer as stable owner Harry Dalton is also spot-on. His appearance onstage is brief but wholly memorable. The stable of horses is created using wire-mesh masks. The stablemates’ tawny coats are rendered by leather vests with long laces that trail down the back to imply tails. The effect – when augmented by the actors’ equine choreography – is utterly convincing. Yet the uniform look does not impede the performers’ ability to establish distinct personalities for the steeds they portray. Kudos to costumer Danielle Riedel. Riedel also manages a subtle but terrific pun at the conclusion of Act 1, one that I first took as an anachronism but that, in thinking about further, fit perfectly. Any awkward moments in this presentation of Equus lie more at the feet of Shaffer than the company. The timeframe is a little murky and probably could have used a mention in the program. Without it, the audience is left wondering about mentions of Philco transistor radios, Doublemint gum jingles, and Briticisms like swizz and Nosey Parker. 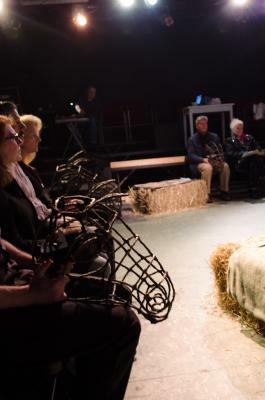 Opportunities to see Equus live on a community theater stage are rare, owing to its complex themes. The current production at Phoenixville’s Forge Theater is worth experiencing before it gallops away.